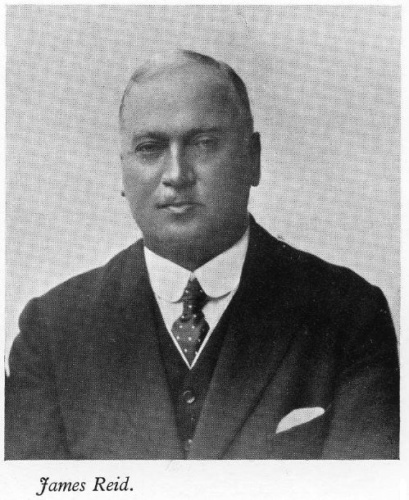 IDJ has sent a series of articles about managers at Taikoo Dockyard: The first manager Philip Forster Nicholson, 1907-1910, “was succeeded by James Reid, who was born in Johnstone, Renfrewshire,[Scotland], and passed his early life at Troon, serving his apprenticeship with the Ailsa Shipbuilding Co., Ltd. He remained with this company to rise to Chief Ship Draughtsman and Assistant Yard Manager before he was thirty. He joined Taikoo Dockyard as Chief Draughtsman in 1908, was appointed Assistant Manager the following year and succeeded Nicholson as Manager in 1910. He was a man of exceptional ability as a ship designer, and in all that relates to ship construction, talents which were of particular value to the Dockyard during the first World War, when its shipbuilding facilities were employed to their utmost capacity. He played a great part in establishing Taikoo’s reputation for producing well-built ships. He served the Dockyard as manager for sixteen years and retired in 1926, first to Troon and then to Glasgow.